Research has shown that when children eat with families, their overall nutrition and diets improve. Did you know you have an antidote to the worries you feel about what your children are eating? It’s right in front of you — the family meal. Families compete with fast-food merchants and companies that target children with foods high in added sweeteners and fats. TV advertisers emphasize high-fat snacks, sweetened beverages and food items with limited nutritional value. Healthy nutrition is essential for young children. Good nutrition boosts their immune system, aids their growth and development, and promotes lifelong healthy eating. Usually meals eaten with family members include less fat, less soda pop and more fruits and vegetables. Mothers often replace candy with carrots, improving a child’s nutritional choices. 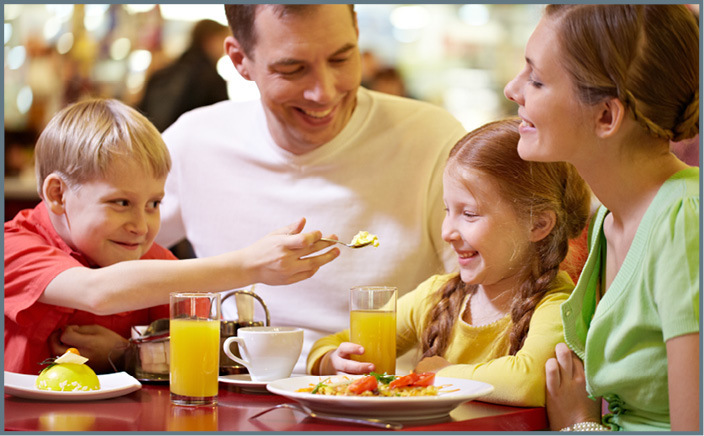 Family meals also tend to be higher in calcium, fiber and other essential nutrients. Children tend to eat better when sitting with others. Adults and children are more likely to discuss healthy nutrition when sitting together at a family meal, too. Children learn to eat what they’re offered. According to child nutrition expert Ellyn Satter, the parent’s role is to provide healthy food for meals and snacks. The child’s role is to decide what and how much food to eat. When parents plan family meals, they can focus on including healthy food choices. When healthful, tasty foods are available, children will eat them. Parents can stock healthy food items, such as fruits and vegetables, for snacking. Be patient, though; you may need to serve a new food 10 to 15 times before the child is ready to eat it..
One of the great secrets of healthy child development is nutrition. Children who eat a nutritious diet are less likely to become ill, and they show better learning and display better attention in school. Good nutrition supports optimal brain development. When you plan and eat at the family table, you give your children better nutrition and a better future. Let family meals unlock the potential of improving your family’s nutrition. Question: How can I plan healthy meals for my family that are within my budget? • Set a goal to plan daily menus for a week at a time. Have family members help in the planning. • Plan your menu based on what’s on sale at your local grocery store. Fruits and vegetables “in season” usually are less expensive and of better quality. • Include a variety of colors and flavors in your menus. • Vary the textures and temperatures of foods in meals. For example, have a cold, crisp vegetable salad with hot, mashed potatoes and meatloaf. • Visit Choose MyPlate for more information about the nutrition needs of each of your family members. Question: We can’t seem to find a time to eat as a family. What can we do? Establish a family mealtime and make it a priority. If your family only eats a few meals together now, try increasing the number by one or two meals each week. Set a goal and write it on the family calendar! Maybe it’s Wednesday evening dinner and Saturday morning breakfast. Simmer broth, tomatoes and vegetables in pot for 30 minutes. Remove from heat and add cheese. Stir until cheese melts. Serve. Each serving has 110 calories, 3 grams (g) fat, 7 g protein, 13 g carbohydrate, 3 g fiber and 730 milligrams sodium. Quick Tip: When preparing a meal, gather all the ingredients you’ll need and set them on or near your workspace. This will save you from wasting time going back and forth to the refrigerator, pantry, cupboard, etc.